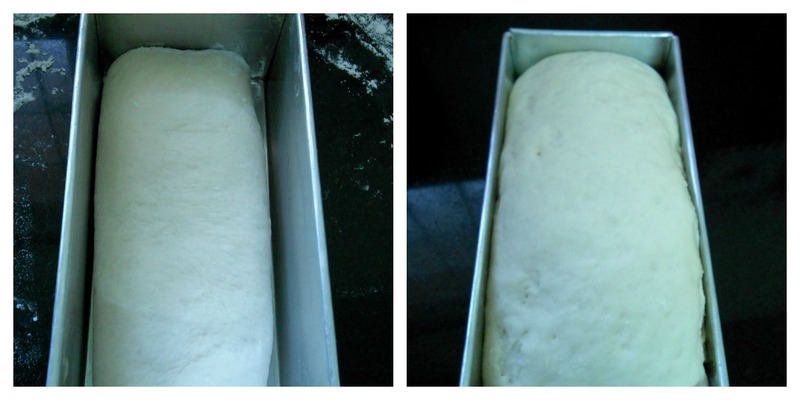 Years ago, on a cold, rainy day in Hyderabad, I made my first loaf of bread. Those were the pre-internet days- I had nothing to guide me except a recipe from a book. I followed all the instructions but had no idea if the dough had been sufficiently kneaded. And being a cold day, the dough wasn't rising. I warmed up my bowl, put the dough in it, wrapped it in a sheet of plastic and covered the whole thing in a quilt. After some 4 hours, I found my dough had indeed risen and so proceeded with the recipe. The aroma of baking bread filled my tiny flat and when the loaf finally came out of the oven, it looked so gorgeous. However when sliced, it was dry and crumbly. It took me quite a few years to have the guts to bake bread again. Bread is the one thing every baker aspires to make. And make it well. Most people regard breadmaking a challenge but once they get the hang of it, the joy of being able to bake a loaf of home made bread cannot be measured. If you are new at baking bread, the easiest thing to do would be to bake a loaf of white bread. I prefer to knead on a worktop. Butter, salt, gluten, instant yeast, sugar, bread improver, plain flour, warm water (approximate). If using bread flour, do not add gluten and bread improver. Mix the dry ingredients, make a well in the centre and pour in the water and add the butter. Place your fingers into the well and slowly start mixing. Keep incorporating the flour, use a scraper to push the flour into the well till the whole thing comes together into a dough. Ideally, the dough should be a tiny bit sticky. Resist the temptation to add more flour. Kneading activates yeast and develops gluten. Stretch the dough by putting the heel of your palm on top of the dough and pushing it away from you, the other hand holds the rest of the dough in place. Roll or fold the stretched dough back, give the dough a quarter turn and repeat the process. In the picture above, you can see the gluten beginning to develop. You will also find the dough becoming less sticky. If it needs more water, wet your hand and keep kneading. How do you know if your dough has enough water? Pinch it. If your fingers can touch through the dough, there is probably enough water. How do you know if the dough has been kneaded sufficiently? Form the dough into a ball and tap it lightly with your finger. It should leave a little depression that springs back quickly. At the end of kneading, round the dough into a smooth ball, place in a greased bowl, cover with cling wrap and leave undisturbed till it doubles in size. This is the first proofing and should take about an hour. My dough took about an hour to rise. As the dough rises, this is what it looks like. Underproofed dough will not have these bubbles. At the end of the first proofing, remove the clingfilm and push your hand into the dough to expel all the air. By doing this, you are preparing the dough for the second proofing. 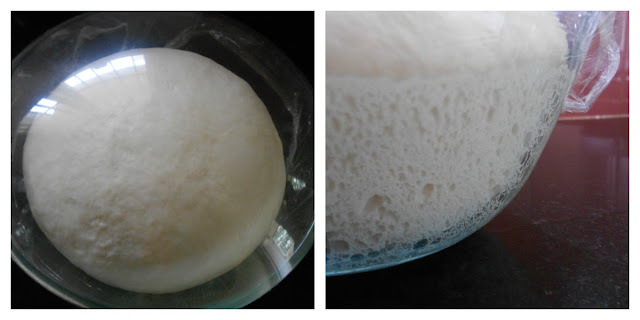 Take the dough out of the bowl and place it on the worktop, knead briefly then form it into a ball. Sprinkle the worktop with flour and place the dough on it. Grease a loaf tin. Mine was 19 cm x 9 cm. Use a rolling pin to roll the dough into an oblong, the same length as the tin but three times as wide. Fold the dough into 3 and place it in the tin with the fold underneath and leave for the second proofing in a kitchen drawer of shelf. I prefer not to cover the top of the tin as sometimes, while removing the covering, the dough sticks to it. When the dough rises to come up to the top of the tin, bake it in a 200°C oven for about 20 minutes. The top should have a nice brown colour and when the side of the tin is tapped it should sound hollow. Remove the loaf tin from the oven and unmould the bread. Let it cool a little before slicing it. Enjoy your hand kneaded, home made bread. 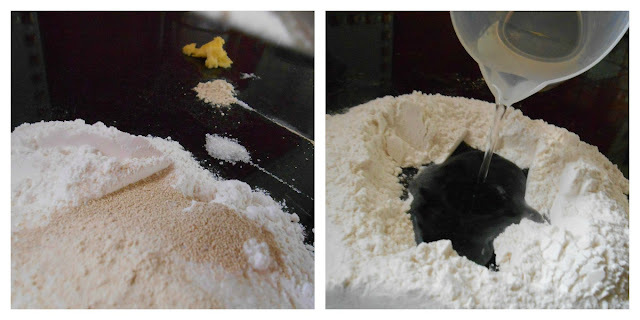 Sift flour onto a worktop, mix in all the dry ingredients. Make a well in the centre, pour in almost all the water and add the butter. 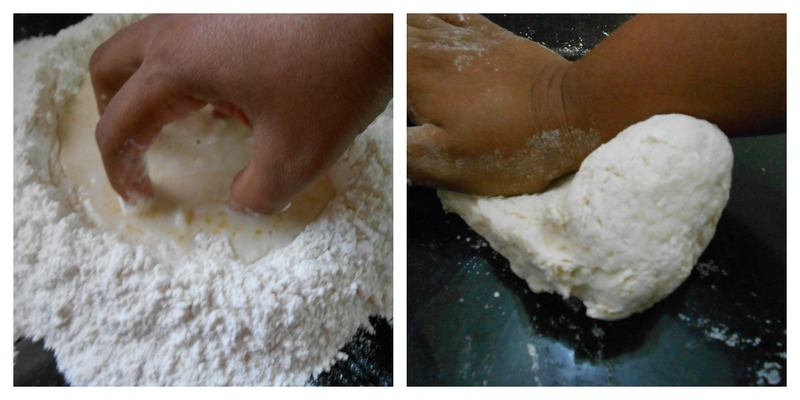 Using fingertips, slowly incorporate the flour into liquid till all the flour is mixed into a dough. Knead well and quite vigorously for about 10 minutes so as to get a smooth, springy dough. Place the dough in a greased bowl, cover with clingfilm and leave to rise till double in size. Remove the clingfilm, push down the dough to expel all the air, knead it again briefly then place it on a flour dusted worktop. Roll it out into an oval three times wider than the loaf tin. Fold the dough into 3, place it seam side down into the prepared tin. Leave it to proof a second time in a kitchen cupboard till the dough rises to the top of the tin. Bake in a preheated 200°C oven for about 20-25 minutes or till the loaf has a nice brown colour. Rap the side of the tin sharply, if it sounds hollow, the bread is baked. Remove from the oven and after a couple of minutes, unmould onto a wire rack. Update: This bread will bake beautifully even if the improver is omitted. ok this is bookmarked. i will use my stand mixer for the kneading though, because i am extremely lazy. I didn't use mine because it is such a small quantity of flour. Do post pics when you're done. You make kneading look so easy with the clear illustrations! Cant wait to try this out. I also like your tip of not covering the dough for its second rising, no wasting preciously kneaded dough by having it get stuck to the cover. For cold climate dwellers like me, can I get the same results if I proof both times in a non heated oven, with just the oven light on? Thank you for sharing another fun Bake Tale! Thank you. The pilot light should work. Otherwise, heat up a pot of water, place it in the oven or microwave and place your bowl with the dough beside it. The heat from the water should help the dough to rise. If I might ask, what is gluten? Is that the shelf name? And is bread improver a must? Can I make this without gluten and bread improver?? do you need a second proving with instant yeast? With fresh, dry or instant yeast, you need to prove it a second time. will try this soon! like the step wise pictures and detailed explanations! Sara where can I buy bread improver in Chennai? will whole wheat bread turn out better ( spongier) if its used. I baked bread which was half whole wheat n half refined flour ...it turned out very well but the loaf felt it weighed a ton n the slices were dense ( but totally yummy). Thank you Rashmi for visiting baketales. You can get bread improver and gluten in the baking ingredient stores on Walltax Road. I think you will find an "improvement" in the dough when you use these products. The cheesecake looks divine. Good that you have given it a twist. Happy breadmaking. I will, in a couple of months!! I would like to learn baking different types of bread. when would you be conducting classes for the same? Hi Saranya, I will let you know the dates in the blog. Thank you for the wonderful recipe and the tips. I bought gluten, yeast and bread improver from Vinayaka stores on Waltax road and followed your recipe to the T. The bread was light , fluffy and yum. Though I have baked breads and buns a few times, they were always dense. They were tasty but never soft like the bakery breads. But this time it came out excellent. Thanks once again for the awesome recipe.